USS Makin Island is ready for commissioning on October 24 at Naval Air Station North Island. 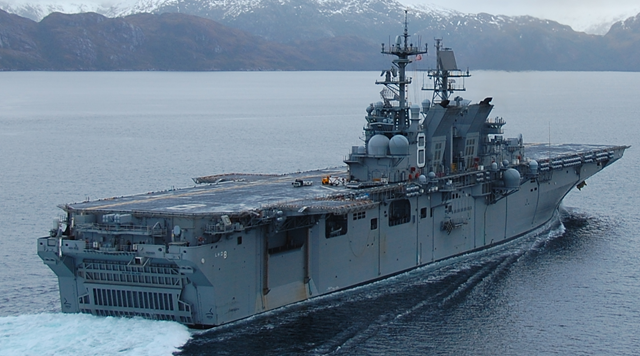 Makin Island is the first of the class built with both gas turbines and an electric drive as Auxiliary Propulsion System (APS). The ship will be using APS for roughly 75 percent of the time the ship is underway and is expected to save nearly $250 million in fuel costs over the ship’s lifetime. The ship has already saved more than $2 million in fuel costs during the ships transit from Pascagoula, Miss., to San Diego. an electric plant to power auxiliaries thereby avoiding steam or associated chemicals. reverse osmosis water purification systems to avoid the need for chemicals like bromine or chlorine. Read more from U.S. Navy. Above photograph is from U.S. Navy.